She is known to like a heel, and is reasonably keen on thigh highs too. Many of the images I have seen recently, have her in high boots, usually with a decent height stiletto heel. But for the fact she's enormously wealthy, and still grieving for the loss of her much loved husband, she would be the perfect woman for me. A couple of days ago, I saw some images of her wearing heels, that just about stopped me in my tracks. I didn't like the embellishments on her skirt, and I thought the buckle on her belt a tad too large, but her shoes were (almost) heart stopping. Have a look for yourself. She looks very elegant and classy. I am amazed that she - or indeed anyone - can get about so gracefully in heels that high. I am amazed that she - or indeed anyone - can get about so gracefully in heels that high. She has apparently always been at the cutting edge of fashion so I would imagine she has plenty of experience with gliding in stiletto heels - even so, it takes good poise, balance and flexibility to do well at it. Perhaps she has had ballet or other dance training. That would do it. Celine's shoes are OK, and certainly a good height, but that set-back heel tends to emphasise her somewhat unbalanced look - as if she is being pushed forward because her feet are being jacked-up at the back! If the heels were positioned more forward under her feet, she would look more elegant - there is too much of her shoe overall lying behind her leg-line. 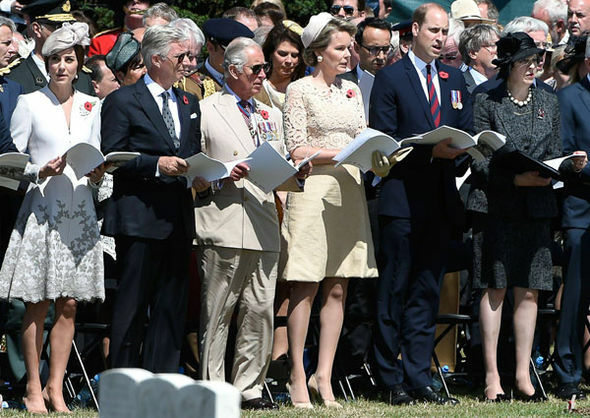 If you saw the Queen of the Belgians on TV today (at the Passchendaele ceremony), you might well agree with me that she looked both attractive and elegant in high stilettos - and walked with ease on what was not the easiest of surfaces, both grass and rubber matting. Kate looked good too, but had hedged her bets with lower stilettos than usual for her. And Theresa copped out with clumpy blocky courts. It's a shame you have not linked a video or news report. I did a search on Queen Mathilde of Belgium, but didn't find anything useful on the shoe front. If you go to 27.30, you will see Mathilde and Kate laying wreaths. Their shoes are shown but the 'banner' does hide some of this - it was not present when I watched live yesterday. This is the best I can do from screen shots of the shoes. They are 4 inches, I'm not sure about 4½ though. I'm not always (but nearly always) concerned about the height of the heel. The rise angle on Queen Mathilde's shoe is about 45' where the rise on Celine's is at least 60'. Experience tells me, anything above 50 degrees is likely to produce discomfort. That angle of rise is important from the point of a challenge to the wearer. The angle of rise created by a 4 inch heel on a size 3 or 4 shoe, is going to be significantly greater than a 4 inch heel in a size 10. Given that Celine's leg-to-foot angle is vertical, I can't see how she could wear a higher heel than that shown, without the heel pushing her point of balance so far forward it would tip her over if she stood still. As I said, I don't recall seeing this previously, unless the foot/ankle/leg was clad in ballet boots. It has me wondering what size shoe she takes since the rise angle shown, on a UK6 shoe might have that heel at well over 5 inches. If she is a size 4 or 5, it could be a more realistic 5 inches. Either way, it looks high, set back heel or not. Ooops, missed some words + grammar. Yes, those are extremely high heels - about the very limit, I would, say of what its would be possible to wear and even then only if your were very experienced and had a high degree of flexibility and strength in your feet and ankles. Walking casually in those, and looking graceful, is am impressive feat, to be sure. I agree from the close-up of Mathilde's shoes that they don't look as high as I suggested before, i.e. 4.5". I can only say that they did seem higher when viewed side-on as she laid her wreath. But they still appear nice, as she does. "Gucci shoes and latex socks". I don't care how 'fashionista' someone is claimed to be, "latex socks" = fetish. The more I look, the more I am convinced, this isn't "fashion". As to Celine, the actual height of her heels is really irrelevant as the angle of her foot says it all. Yes it does. An article (or two) claim 6 inch heels, though I suspect 5½". Nice find BTW. Why am I wearing this skimpy/shiny black outfit and high heels? Because I'm going water-skiing of course. The more I see, the less I like about her clothes and general appearance, heels aside. The pic above makres her look borderline anorexic. She comes across as elegant if idiosyncratic to me, and I quite like idiosyncratic! Idiosyncratic, certainly, and she is worth a second glance. Elegant, perhaps, but such quirky fashion is not really 'elegant' in my book. The pic above makres her look borderline anorexic. She has the same frame size I once had. Back then I would/could eat anything and everything, and wouldn't put on weight. She obviously spends less time at KFC and McDoodles than most others. I like slim. As an aside, overweight people don't do heels. Not for long anyway. Her slimness will help her keep wearing a high heel. If she were British, we'd be calling her eccentric. Some of the clothing she wears is plain bizarre, but she's nearly always in a high heel and often in (suede) thigh highs, so I've nothing really to be disappointed with. I think she looks quite nice! The shirt is at least 2 sizes too large. Something oversize like that, shouldn't be tucked in. Huge pockets on a small frame don't work either. The skirt is bulky and overpowers her frame. A knitted (cable) sweater top would have balanced the outfit a little better. It would then have looked like a winter outfit, but then the skirt and boots are wintry clothing. Someone worth in excess of $380M and having an interest in fashion, shouldn't be making such basic "mistakes". I'm being critical because unlike 'any other woman' on the streets, Celine has the opportunity to dress in clothes very few people have access to (designer priced), though being such a high profile personality she would probably be gifted styles to promote the fashion houses anyway. I'm not 'hating' her dress sense in the outfit above, I just look at it and think "oops". The last shown here, is particularly good for her body shape. The dress in the middle picture nips in at the waistline showing her her slenderness. The short hemline in the first picture, showing off her long legs which helps to accentuate the shapely bodice of the dress (where there might not actually be much shaping). I mentioned her the other day, and realised I'd not seen anything of her in the media recently. An older photo, but one pleasant to my eye. A very nice look. Stylish.